Located directly above the Sea Ranch's most beautiful sand dunes, at a cul-de-sac near 'Walk-on-Beach,' this small home has picturesque ocean views from every room. Our 'House of Peace' has large wrap-around decks and lots of privacy. The 'Casa Pacis' home has approximately 1000 square feet of rented living area, including a view loft. It features ceramic tile floors and wall-to-wall carpets, as well as vaulted ceilings in all rooms. Large windows, comfortable furniture, a cozy conventional open fireplace, and decor will contribute to making your stay pleasant and memorable. The kitchen is well equipped with modern appliances. Enjoy the extra-large deck area with built-in hot tub (with ocean view), and the overall uniquely private yet close-to-ocean setting. * This home is available year round, subject to prior reservations. * Cleaning service and linens are provided. * Refundable damage/security deposit is required for each rental. * Rental occupancy limit is two adults. * No Pets, no Smoking, no Children (exceptions possible). * You will find more information and pictures in our specific website (see link below). Ever since we discovered The Sea Ranch in 1970, it has remained our favorite vacation destination. The natural beauty is, every time anew, amazing. The climate at Sea Ranch is markedly warmer and sunnier than elsewhere on the Central California coast (i.e., between Monterey and Bodega Bay). We discovered Sea Ranch shortly after we had immigrated to the United States, and immediately fell in love with it, probably because it reminded us in natural beauty of the Amalfi Coast in Italy and in climate of the German North Sea islands. We purchased our lot and built Casa Pacis in 1983 and enjoyed every minute of our numerous stays in this gorgeous environment ever since. It is remarkable that, even though many years passed since we first visited Sea Ranch, the unique character of this incredible place has been preserved. In 2010/2011, much of the interior and exterior was renovated. There is also an outside hot/cold shower facility intended in combination with the hot tub. Due to its distance from urban centers (about 80- miles from Santa Rosa, 110 miles from San Francisco), Sea Ranch would be considered to be in a rural location. unobstructed ocean/white waterviews from every room. Casa Pacis is in Sea Ranch "meadow" location, with about 100 yards of undeveloped meadow between the house and a sandy cove to the right and sand dunes to the left. White water views from every room. We provide linens and towels, and King bed is made upon your arrival; should renters need to use the second bedroom, that bed is mad up as a sofa, and linens are in the closet. Equipped with sofa, two new Scandinavian-Style recliner chairs with ottoman, 6-person dining table, 32" flatscreen TV with HDMI cable input (DirecTV), and stereo system with iPhone/iPad input. all rooms and decks at the same level; two steps from driveway into house. The master bath may be too small to accommodate a wheelchair. Gravel driveway and parking area. Highly recommended. The house is perfect for a Sea Ranch getaway. It is located close to some very nice beaches and coves, has very nice views of the ocean from every room, very cozy and comfortable. Large windows in every room bring in light. Nearest houses are far enough to give a sense of privacy. The owner makes the stay easy with clear instructions and helpful hints posted around the house. Thank you! I really enjoyed my stay at Casa Pacis. The cabin itself is lovely, clean, and has a super cool retro vibe. It was wonderful to wake up in the morning to the views of the waves crashing against the shore and to wake up with the shine of Sirius twinkling into the bedroom. There's lots of books to enjoy and I particularly loved reading through the collection of American short stories. Please do make sure to take time to read through the rules. There's a handy binder the host leaves for you so you can reference what to do (or not do!) during your stay. Looking forward to hopefully returning to this place one day. Indeed, the Sea Ranch "Rules" -- albeit easy to follow -- have become quite important. In an effort to minimize the impact of Short Term Rentals on the resident Sea Ranch community, the Association has imposed a strict set of rules that became effective on 1/1/2019. They apply to all rental homes and limit occupancy, sound and light intrusion onto other properties, and prohibit smoking, flying drones, trespassing, and speeding. They require extensive signage. a charming house at a great location, views were fabulous. parts of the house are a bit dated (horizontal levelor blinds) but that is ppart of the charm - we loved the art from plants and the keyless entry system is great. we would come back. Indeed, we are using Levelor blinds as best compromise to be able to enjoy the expansive ocean views from every room in the prevailing southwestern view direction of the house at any time of the day. Relaxing, good views, deer almost every morning, good location. Place needs a little maintenance, toilet keeps on running after every flush. Most of the blinds don't work or have missing parts. Other than that we enjoyed our stay and would go back if the maintenance was done. Indeed, extensive maintenance was done after departure of these guests. We appreciated hearing from these renters about items that needed attention -- after numerous back-to-back rentals during the summer months, they were the first ones to report them. Everything is now in good working order. Mixed review . The good and the not so good. Maryann Elliott B.Freeland WA, Madison WI, Park Forest, I'll. When we first walked in, we thought what a lovely house and property. The two main chairs and dining room set were very comfortable. The owner has lots of rules as does Sea Ranch more than any other of the VRBO units we have rented in the past. Unfortunately, the dish washer was not working and a service man declared it no longer repairable. Klaus likes to maintain the property himself and seems to be quite responsive in some ways. It was rainy season and the lighting was poor with 40-60 watt lamps. Klaus brought over better bulbs. We really did not like the limited light in the garage where a newer washer and dryer were located. This would not be a problem for short stays but we had booked for three weeks. When I complained that the bed sagged to much for my back, Klaus put two large pieces of cardboard on my side and brought a trundle mattress from the other room so for the duration I was 4 to 5 inches higher than my spouse. The bed was better but after two visits to a chiropractor and lots of rain we decided to return home a week early. Klaus's book of rules etc clearly states no refunds under any circumstances. We like Klaus but at one point when I suggested a handle on the side of the building to deal with the very high second step, Klaus told me he was on vacation and I had asked for enough. He did buy a new dish washer but it did not fit the space and as he said, he had to get back home to the Bay Area so he would not be able to jury rig it to get it in prior to our departure. Of course the fact that January is definitely part of the rainy season did not help. We had a few nice days and enjoyed the trails, deck and hot tub. If you like to cook, the cottage is well appointed but be sure to bring you own knives as his do not cut adequately. There are few good restaurants in town and access is on Hwy 1 along the coast. Because of all of the rain, the ocean lane of the highway completely collapsed. The nearby town of Gualala has a two good groceries and the folks in town are very friendly. Talking to several in shops etc., it was stated that Sea Ranch people are different. There is no gate at least in off season but this is a "gated community" where you have to carry special identification and a car tag in case police stop you. So beautiful scenery in a very remote location & that is what the residents value...their privacy. However, it is something of a ghost town in January as many of the cottages are boarded up for the winter. 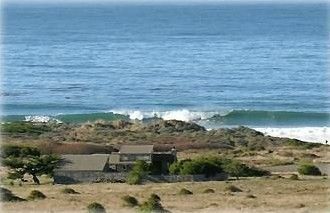 February is usually a great month at Sea Ranch, with some rain and lots of sunshine. This time it was not only the other way around, but a historical record year for rains, with flooding, road closures, mud slides, and disaster declarations. This can be annoying for everybody. Indeed, I felt so much for these guests who came from afar, only to get in the midst of this unusual weather pattern, that I offered much extra help: I installed $140 worth of new light bulbs; accommodated postal mailings of medications to them via our housekeeper (no postal service at Sea Ranch; UPS and Fed-Ex ok); hand-delivered 15 classical music CDs for their enjoyment; after sending 2 lengthy specific emails, in spite of detailed written instructions in the house, I personally visited the guests and explained to them how to use the TV and play a DVD; and performed many more services to them. We do not have “rules” — we have a few “guidelines." We have no “rule book” — we have a “frequently asked questions” section in our Casa Pacis website, of which we provide a hard copy in the house for the convenience of our guests. The overwhelming majority of our guests find these very helpful — after all, it is only natural that there are things in a vacation rental house that are different from what our guests are used to in their own homes. With regard to the mattresses, some people want it soft, others want it hard. What should one do? We provide the mid-range, NOT sagging, topped with a 3” memory foam padding. The new dishwasher is installed and working fine, and Casa Pacis is, as it has been for many years, serving multitudes of 100% satisfied guests. WOW!! Sunny location, end of the road privacy, 150 feet to the bluff trail: Casa Pacis is the perfect getaway. Klaus is a thoughtful and accommodating host, and although he was out of the country, he took care of our minor concern immediately. We felt totally at home and comfortable, and look forward to our next Casa Pacis retreat. Indeed, whether we are nearby or on travel far away, we strive to always respond to questions from our valued guests immediately and, if needed, to delegate a response to our housekeepers or handyman. Located on the Pacific Ocean Coast; hiking (10 miles ocean bluff trail, tens of miles of meadow & hill-side trails with beautiful ocean views); Swimming (3 recreation centers with saunas and tennis courts), all free of charge; many miles of Sea Ranch internal roads with very little traffic are ideal for leisurely bike riding.